Tuesday 16th March at the ECEC. Venue: Euroa Community Education Centre (ECEC), 50 Binney Street, Euroa, Vic. 3666. Welcome Peter welcomed everyone to the meeting. Danny Lythgo introduced our special guests, Derrick and Kenneth Bwihambi. Derrick wrote a song to celebrate all the support that he and his family have received in Australia, and from Shepparton in particular. The song has been recorded as a rap dance routine called “Say Thank You” . This movie was shown to eMug, to great acclaim. 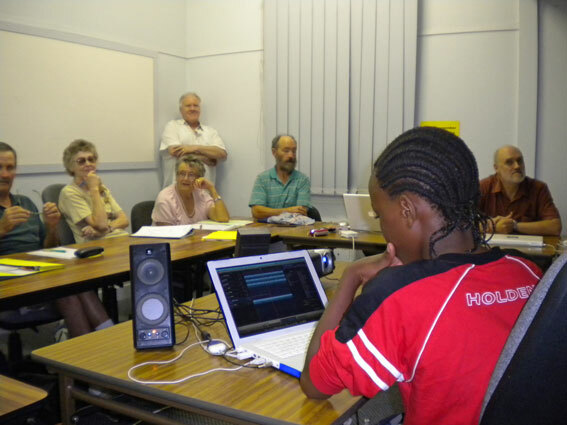 Kenneth (Year 7) tutoring some more experienced Mac users in the art of Garageband (Photo M. Jesser).